All Spiritual Counselors are certified by the Universal Church of Spiritual Science. 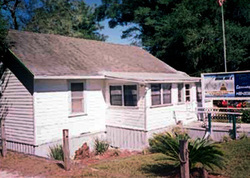 Matthew Sekunna's father, Dr. Ernest M. Sekunna, is one of the founding fathers of the Universal Centre of Cassadaga. He founded the Universal Centre in 1970 with a small group of other Sensitives. The mission of the Universal Centre is to be an organization that allows people from many walks of life and many spiritual disciplines to explore the various Truths that all of us encounter as we search for our own truth. This is why there is such a wide variety of disciplines represented and services available for you at the Universal Centre. Spiritual counseling and readings have always been, and still remain, an integral part of the Universal Centre. Today, Matthew carries on his father's tradition of excellence. The Universal Center also offers a wide selection of metaphysical books and gifts. After 45 years we have decided to close the Universal Centre and focus on our family. Matthew is still available for in person and phone readings by appointment.